I don't know you. But I do know how it feels like to miss something so much, that you'd be willing to do almost anything to get it back. I know what it's like to go to bed in tears… thinking you've lost everything. And I know how it feels like to want something so badly, that you can't stop thinking about it no matter how hard you try. … and to make him fight for you, tooth and nail, until he finally has you in his arms again. ...the more likely you are to become a distant memory in the back of his mind. You'll be shocked at how much he'll want to call you, text you, and be with you all night long. You'll be blown away by how quickly he'll forget that other girl you thought he had a “thing” for. You'll be astonished at how much time he'll spend fantasizing about you, thinking about you, and craving your touch. And you'll be amazed at how incredible it feels to wake up every morning with him by your side... Knowing he's never going to want to leave you again. I know this sounds impossible, but it isn't. Your relationship is no different. So it doesn't matter what mistakes you've made (or he made) up until this point. It doesn't matter if you've already begged and pleaded for him to take you back. It doesn't even matter if you think he's madly in love with another woman right now. Your relationship with him is fixable, even if you don't think it's possible for him to ever love you again. ...he'll be pinning you against your bedroom wall, gazing at you with that look he used to give you, and kissing you like you're the last girl he'll ever kiss. FACT NUMBER ONE: Chances are, you're so heartbroken right now that you're probably doing or saying things that are pushing your ex further away from you… without you even realizing you're doing it. If you want to ever regain that attraction ever again, you'll have to press the reset button. FACT NUMBER TWO: You're going to have to accept that your ‘old' relationship is gone, and you can't have it back. And that's actually a good thing, because your ‘old' relationship sucked anyway... After all, if your relationship was going so well, then why did you two break up? Let me make it clear: I don't mean that you can't have your ex-boyfriend back.... I mean that you have to start a new relationship. A healthy one, free of cheating and lies and all the other things that led to your breakup in the first place. FACT NUMBER THREE: In order to win back your ex-boyfriend and establish a new, healthy relationship, you need to erase all of the negative memories and thoughts he has of you... And replace them with positive ones. You need to tap in to his primal, subconscious feelings and plant the seeds of passion, romance, and sexuality so that he can't imagine himself with anyone else. But don't worry... I've done the hard part already, and developed a step-by-step system of techniques that will quickly change his feelings about you... And, in no time at all, start re-building passion and romance. Listen, I've been a relationship expert for over a decade. I've been called the ‘relationship geek'. I've worked with thousands of couples - and in particular, thousands of women in the midst of a breakup - to fix broken relationships and build new ones that are oozing with passion and genuine love. How did I figure out the recipe for success? How can I help 90% of all women get back together with their ex? It took a few years of learning and testing, but I've managed to break down the male psychology to its core.... And learn exactly what ‘makes guys tick'. I've identified the key buttons that women need to push in order to engage with a man's hard-wired feelings and desires. These buttons are the key to your success. Once you know which buttons to push, you just need to go out and push them... And that's why I built a comprehensive step-by-step guide to help women through the process of healing their broken relationships. Listen, I'm not talking about the kind of “secrets” you'll hear about on late-night tv infomercials. I'm talking about real, proven techniques that I've tested and perfected over years of work with real women in real relationships. These techniques work so well and so consistently because men are literally powerless to resist them. How can he resist you if he has no idea you're even trying to get back together with him?? I'll teach you how to tap into a man's primal instincts, fire up his “romantic brain”, and mold the image of you that he has in the back of his mind. He'll be banging on your door on all fours, pleading you to come back to him. That's the real beauty of my methods, and the secret sauce to my program: I'll show you how to breeze straight past his ‘warning systems' and natural urges to resist your advances. Now, this isn't rocket science... But what I can tell you for certain is that you definitely haven't read or heard much of the stuff I reveal in my program. How you can get him thinking about you and longing for the “good old days” he enjoyed when you were together.... Without even saying a word to him! How to re-ignite his feelings for you - even if he's already with another girl! ...and there's hundreds of other practical, real-life techniques you'll want to apply right now if you're dead serious about building a new life with this man by your side. What I've told you in this article is just the ‘tip of the iceberg'. At this point, you're probably well aware of how effective these techniques are... And you're probably wondering about the price. Don't worry, it's not going to cost you an arm and a leg. But ask yourself... Do you really love him? Is he “the one”? ...then it probably doesn't matter how much my program costs. Because you really can't let him get away, no matter how much it costs. A few years from now, looking back, you might be willing to pay thousands of dollars for one more chance to get him back in your life. ...wondering if you could've done or said something that would've made him come running back to you, eager to spend a lifetime together. But, do you remember early in the article, when I said that I'd guarantee my program would work for you? I guaranteed that by following my advice and applying my strategies, you'd be able to turn back time and return to the days when you and your ex were madly in love. ...I wasn't kidding about that. I'm extremely confident that my program will work... Will provide you all the tools you need to rekindle that spark with your ex and show him what he's missing... And I really want you to try it. So, here's the deal: you sign up for my program, follow it cover to cover, and apply the step-by-step strategies I've laid out. Don't worry about rushing the process, either: you've got a full two months to apply my techniques and build a new life with your man. Yep, for a full 60 days after you sign up for my program, you can click your mouse a few times and get a 100% refund. All designed to make the process of getting your man back into your arms simple, straightforward, and effective. ...but said it would cost you a bucket full of cash, how much would you be willing to fork over? Surely, if he's “the one,” then you'd run to the nearest bank and withdraw your life savings, right? But, like I said, I really want you to try the program and see for yourself how well it works... And I don't want the cost to prevent you from trying it out. Yes, that's a one-time payment of $47.00... In exchange for a proven system that's helped thousands of women from around the world get exactly what they're looking for: a second chance with the man of their dreams. 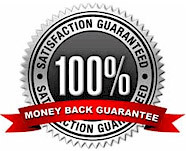 Remember: The 60-day money back guarantee means there's literally zero risk. Sign up, try it out, and I suspect you'll be extremely pleased with the results... Just like the other thousands of women who've used it successfully. But, in the case it doesn't work out, you just click a button and get your money back... No questions asked, no hassles, and no bullsh*t ‘restocking fees'! It's time for you to put aside the excuses and get going. Every second you wait on this is another second your ex could be falling for another woman. If you leave this website right now and say to yourself, “I'll think about it,” that's fine... Just be aware that the “window of opportunity” to get your ex back will only be open for so long. Eventually, he'll start to drift further and further away from you... You'll become a distant memory, replaced by some other woman. So if you're dead set on getting this guy back in your life, the time to act is now, not later. There are no physical products, which means you get instant access and can begin right now, even if it's 3am and you're sitting in your pajamas in front of your computer. By the way.... I get a lot of emails and comments from women who've used my techniques and seen fantastic results, so if you're like most women, you'll be blown away by how easy it is to understand and employ the step-by-step instructions I've outlined in the program. If you can read english, you can make my techniques work for you. Oh, and one other thing you might be wondering about... I know you might be a little weary about giving your credit card information over the internet. I totally get that, and I'm the same way. That's why I've chosen to use ClickBank, the world's leading digital product retailer, to process payments. So even if the program is only half as effective for you as it was for hanna, isn't it still worth $47 to find out for yourself? Don't you owe it to yourself to at least give it a chance? If you don't, you'll truly never know what “could've been” if you'd forked over that 47 bucks. Click the button below to sign up and get immediate access to the entire program. Don't worry, when you click the button, you'll see a summary of the program costs and what you'll be receiving for your $47... Plus info on my 60-day money-back guarantee. Oh, and thanks so much for stopping by my website today. I sincerely hope that this article and my program will give you everything you need to re-build a devoted, lasting relationship with the man you love.